I also used the Well Said Cling Bundle for the stamped greeting and the die cut "birthday" word. 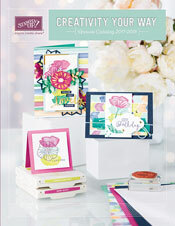 It's a fabulous set with so many greetings, and a stamp for nearly every occasion. Some gray polka dot paper from the Neutrals 6" X 6" Designer Series Paper, a card base in Smoky Slate and some Silver Baker's Twine. Here are the colors that I used for the birthday card. So pretty! I got the idea for this card from some Chrismtas tags that I made recently. This color combo is Call Me Clover, Granny Apple Green, Pool Party and Poppy Parade. And, here is a video of me coloring one of the greetings on the tags. I used the Triple Banner Punch for the tags, some silver metallic paper from the recent Holiday Catalog and more of the Silver Baker's Twine to complete these tags. Well, that is all for today. But you should definitely check out the other projects over at the TGIF Challenges blog.